Weighs 31 1/2 lbs. (for 16" and 18" models) and less than 34 lbs. (for 20" and 22" models) excluding foot riggings. Quick release axles allow tool-free removal of the wheels (16", 18"). Swing-back arms with patent-pending push-button arm release. Height adjustable seat back (16"-18"). Cast aluminum seat cradles for durability. This durable chair features a carbon steel frame with chip-resistant chrome plating and threaded seat screw inserts reduce stripping from upholstery changes. Elevating legrest models features a notched, maintenance-free stainless steel ratchet bar. Padded and upholstered armrests and calf pads provide style and comfort. COLOR: Black Limited lifetime warranty on frame and crossframe. One year warranty on all other "wearable" parts. Available in 12 different configurations. 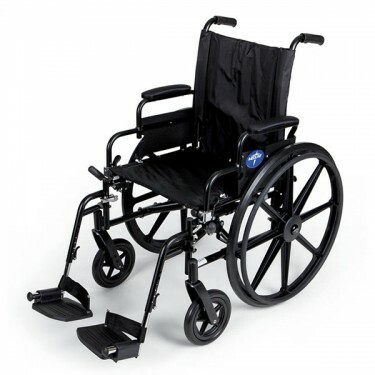 Purchased this wheelchair for my Mother. Meets her needs perfectly. Parentgiving has great service. Easy to use website and prompt shipping and delivery. Pros:Folds up, dismantles for easy transport, great for narrow door ways. Weight Capacity: 300, 350 lbs. Option: 16", 18", 20", 22"